About Us — Pure Kakaw - cacao drinks for creativity, health & ceremonies. Through travels in South and Central America we got first experience with pure cacao. And it has been impressive. Before, we only knew cacao as the ingredient for chocolate or chocolate milk. Apart from stories about its health benefits, less is known about its tradition as a sacred plant. We learned how cacao as an ingredient for most chocolate is highly processed for taste, costs and derivative products. This processing destroys many healthy and active ingredients which make cacao so special. Experiencing the power of pure cacao added a whole new view. An experience we love to share. Find the best quality cacao for potent cacao drinks. Support agroforestry farming, ecology and biodiversity. Create transparency and fairness in the supply chain. Bridge spirituality and science for healthy living. We want to share cacao and explore further why many native people valued this plant so highly. The Mayans used the word 'kakaw' which we use in our name with respect to a time when cacao prospered. We feel it is time again to experience how cacao can support us in health, positive energy, meditation, creativity and focus. Hi, let us also quickly introduce ourselves. Our names are Erik & Leonie. We started the Pure Kakaw project because of our fascination of the effects that cacao has on the body and mind. Our base is in Amsterdam but you can often find us exploring different corners of this world. Leonie is a yoga teacher and combines cacao with yoga, meditation and breathing exercises. Erik loves the jungle, complex ecosystems and searching high quality cacao at agroforestry farms. For us a cacao drink does not start with the beans, but the soil and area where it grows. Looking for info about cacao in Dutch? 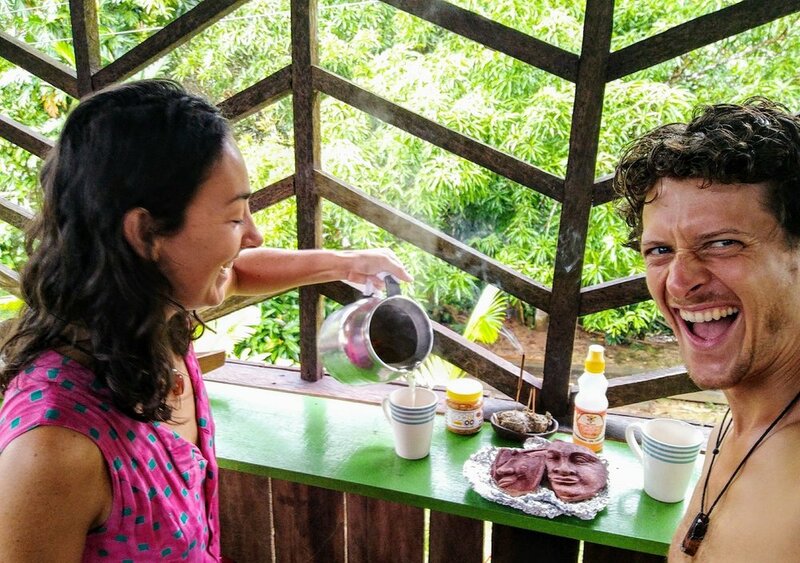 Sharing cacao drinks in the Amazon. This is where Leonie envisioned the Cacao Bar that we opened exactly one year later in Amsterdam. In modern times we search connection to (our) nature, which can be a challenge living in cities and being surrounded by technology. We see more and more people exploring ways to connect with themselves and each other; have a meaningful impact on the world; and want to live a healthy life. For us cacao supports us in doing so. Whether you use it for spiritual purposes, meditation, deepen practices like yoga, creativity, focus for work or just want to eat healthily.